The vegans are descending on Austin for Vida Vegan Con. Lots of other people will tell you about the best food and most popular activities in Austin. I wanted to tell you what I always want to know when visiting other cities. Where are the best cookbooks? Where can I spend some time with kitties? And where do the locals grocery shop? A stack of cookbooks I saw the last time I was at Half-Price Books on Lamar. It’s pretty representative of the books I often find for sale there. Obviously, Book People is worth a visit whenever you’re in Austin, but I’m a big fan of two other spots for cookbooks. 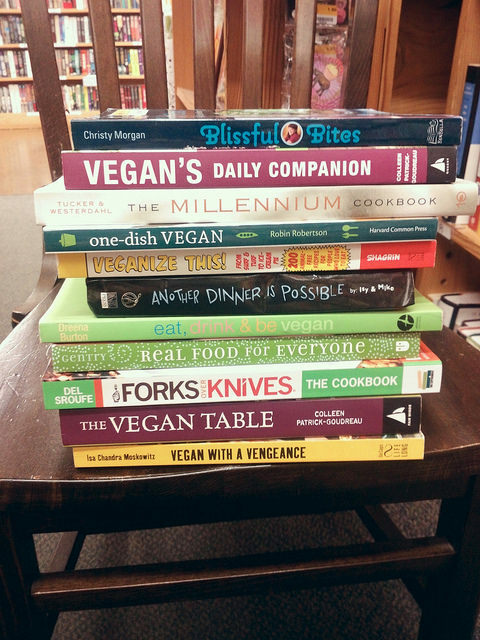 Monkey Wrench has a really interesting selection of old school vegan cookbooks. The kind that talked about diy and self-sufficiency before those topics had their own TV channels. 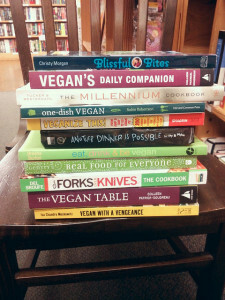 Half-Price Books has a surprisingly great selection of vegan cookbooks. 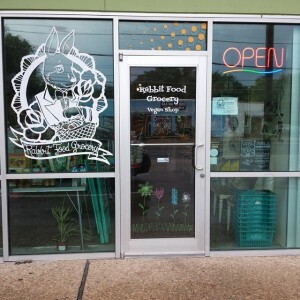 I especially like the location at Lamar and Koenig (and check out the Good Will next door while you’re in the area), but all of the Austin locations have really great vegan cookbook selections. Per the name, books are priced at half the barcode price. Bonus: Stop by the feminist bookstore Book Woman to pick up board books about nontraditional families and other hard-to-find radical children’s books. The game store next door is also worth a visit. 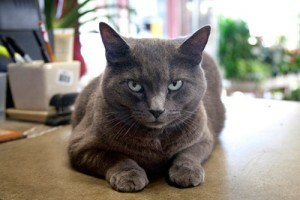 The Shoal Creek Nursery Cat. Dragon’s Lair Comics has two delightfully fat cats and a good selection of games and current comics. In the back, you’ll often find tabletop games in progress. Butterfly Bar is a nice, mostly outside bar with an Italian food truck called Patrizi‘s that will make you something vegan off-menu (thank the vegan bartender for this!). Get a white sangria and pet the cat that roams the area. Shoal Creek Nursery has a nice selection of organic seeds, planters, yard art, succulents, and the usual outdoor plants. And, of course, a garden cat. Rabbit Food Grocery’s adorable storefront. Rabbit Food. It almost goes without saying, but visit Austin’s all-vegan grocery store. You will regret it the rest of your life if you don’t. They have all the vegan products you’ve been wanting to try as well as a great selection of purses, bags, shirts, and other nongrocery items. Recommended buys: soy curls, Lavanila deodorant, Sweet Ritual caramel sauce, Yellow Bird hot sauce. The Whole Foods on Lamar is the chain’s flagship store. I think it’s more interesting for its prepared food than its groceries. You’ll spend an hour trying to decide what to get from the buffet, raw food bar, sandwich bar, sushi bar, smoothie bar, pizza bar, taco bar, or prepared food case. Good luck and godspeed. Central Market is the upscale part of the local HEB chain. This is where you go to find the One Perfect Apple. Or really expensive olive oil pressed by cloistered nuns in Spain. Or other expensive things you purchase because for one short minute you know it’s the one thing keeping you from a perfect life. If you have kids in tow, there’s a nice playground. Recommended buys: window shopping, fresh tortillas, kale salad from the prepared food case, soy gelato. MT Supermarket is a large Asian market. It’s mostly Chinese, but you’ll find products from all over Asia in the store. I mentioned above that sensitive vegans might want to skip visiting Fiesta. That goes double for MT. You will notice a strong fish smell and see people buying live animals. If you can get past that, there’s a fascinating supply of noodles, ramen, vinegars, soy sauces, fresh produce, fresh tofu, and other ingredients. There is an entire freezer aisle of mock meats. Wheatsville Coop is our local food cooperative. It’s aesthetically nicer than many coops. Lots of vegan products throughout the store. Like Whole Foods though, you probably are more interested in this store for it’s prepared food. They are famous for their popcorn tofu and vegan mac’n’chese. They carry a lot of the same vegan products as Rabbit Food. Be cool and purchase from RF, mkay? The Flag Store has a more official name (Hyde Park Market), but you’ll immediately understand why no one uses it. The outside of the store is covered in various flags. And they’re all for sale. Have you ever been awake at 2 AM and desperately wanted snacks (no comment on what you’re doing up at 2 AM that makes you want snacks). The Flag Store is what you’d create if you made a store that sold exactly what you want to buy at 2 AM. And then crammed everything into a hoarder’s house. 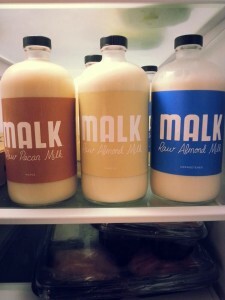 Every kind of vegan ice cream you can imagine. Cookies. So many cookies. Chips in every flavor. Frozen pizzas. Candy. A huge variety of beverages, including sodas, juices, kombucha, wine and beer. Literally every beer it’s legal to sell in Texas. A quick note on gluten: Because even minuscule amounts of gluten can cause havoc for people with celiac disease, restaurant staff need to take special care to prevent contamination issues. I consulted Jessica of ATX Gluten-Free about which restaurants have a good reputation for preventing cross contamination, and these all passed the test. But if you have celiac disease or a severe allergy, it’s always a good idea to check in with your waitstaff before ordering. This is the perfect spot for breakfast. Order off the gluten-free menu. The staff is well-informed about both gluten-free and vegan diets. The most popular order seems to be the El Tipico with tofu scramble, though my personal favorite is the Tofu Chorizo tacos. Casa de Luz is an experience. You pay when you enter. Seating is communal, and you both serve and bus your own table. The menu varies day to day, but you can expect some combination of beans, whole grains, greens with a sauce, a vegetable dish, and fermented vegetables. If it sounds bit hippie, that’s because it is. Meals are all gluten-free and vegan. Desserts are an extra charge, and some may contain gluten. Gluten-free items are clearly marked on the menu. My favorite xgfx item is the tempeh reuben, made with local Hearty Vegan Tempeh, sauerkraut, and cashew cheeze. Ask for gluten-free bread on your sandwiches. Keep an eye on the daily special. If you feel like a splurge, try the raw cashew cheeze plate or the spicy baked artichoke dip from the appetizer menu. Both are fantastic. Check out the veggie and gluten-free section where vegan and gluten-free items are marked. Chili cheese fries (skip the sour cream to be vegan) and frito pie are highly recommended. Grab a gluten-free menu by the door and ask for the vegan menu at the cash register. Stare intently at both until your eyes cross. Then order a vegan burger (no mayo please!) on rice bread with a side of sweet potato fries. Or regular fries, if you’re boring. Other good choices include an avocado and tomato sandwich or a veggie wrap. Their regular menu has icons for both gluten-free and vegan options, which is nice because you can order off the same menu as normal folks. Get a pot of tea, crook your pinky, and then pig out on a Buddha bowl. The great news about Tacodeli is that all of their vegetarian tacos are also gluten-free (obviously, choose corn tortillas). The bad news is they’re only open for breakfast and lunch. I highly recommend the Freakin’ Vegan, even if you feel like a doofus ordering it. And bonus, their famous Dona Salsa is xgfx. This is a fast-casual restaurant from the people behind Clay Pit. Check out their gluten-free menu, which has icons for vegan options. Almost all of their vegan items from the regular menu are also gluten-free. I can’t get enough of their madras soup. If you get a dish that comes with chutney, ask for the vegan chutney as their standard chutney contains yogurt. This quirky place is half Thai restaurant half coffee shop and serves wonderful desserts, many of which are xgfx. Gluten-free and vegan items are clearly marked in both halves. While the Thai food is great, be sure to save room for dessert. Adventurous eaters should try some of the more unusual flavors of ice cream, which in the past have included Texas Corn, Thai Basil, and Ginger Lemongrass. Newcomer tip: order your food at the counter. They’ll bring it out to you. The entire restaurant is gluten-free, which means this is a good spot if you’re very sensitive to cross contamination. The vegan options aren’t super exciting, but if you’re gluten-free you’ll be thrilled to be able to eat sandwiches (with multiple bread options!) and pizza, even if the vegan toppings aren’t exciting. Be sure to check out the Sunday brunch buffet which comes with either a mimosa or juice. This is the perfect spot to pick up a xgfx dessert. 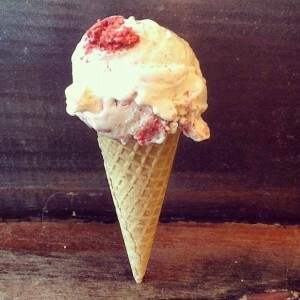 Their homemade waffle cones are gluten-free, and most of the ice creams are gluten-free as well. And of course everything’s vegan. The homemade salted caramel sauce is highly recommended. There are few things more satisfying in life than being asked your opinion. So grab a hot beverage and get ready to tell the world who has the best vegan food in Austin and Dallas. And then let the satifaction of being right roll over you. 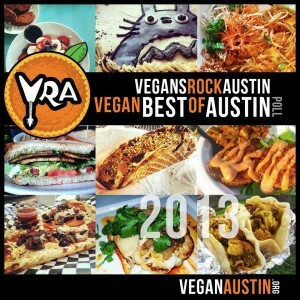 Vegans Rock Austin is hosting the second Vegan Best of Austin poll. You can vote in thirty-seven categories including Best Coffee, Best Late Night Grub, and Best Fried Food. Voting ends Wednesday, December 4. 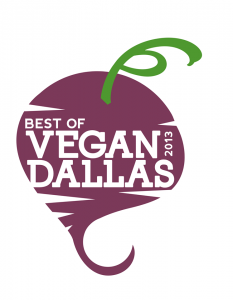 Dallas Vegan has launched their own Best of Vegan Dallas poll with eighteen categories. For someone who only visits Dallas occasionally, I think I need to adopt the voting ballot as my to do list! I’m especially excited about the Best Bar category. Voting ends Monday, December 2. One thing I really like about both contests is that they include a really great mix of vegan and nonvegan businesses. I love when the vegan movers and shakers get credit, but I also love an opportunity to tell nonvegan restaurants that we noticed they’re offering awesome vegan options and we appreciate it! 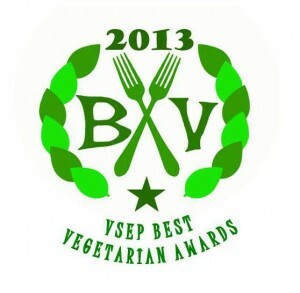 The Vegetarian Society of El Paso also voted on a Best Vegetarian of El Paso recently. They were so quick that I missed my opportunity to tell you to go vote. They’re announcing the winners this week, so keep an eye on their Facebook page. 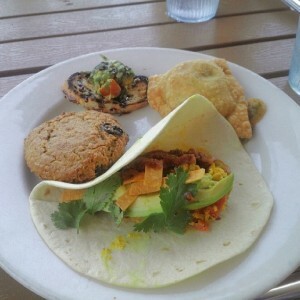 Let’s eat vegan in Abilene, Texas, about two hours west of DFW. You’ll notice a lot of chain restaurants on this list. Partly, this is because chain restaurants abound in Abilene. Partly, it’s because it’s easier to verify whether dishes are vegan when you’re dealing with national chains. As always, please let me know if anything on this list is inaccurate or out-of-date. If you live in Abilene, consider asking area restaurants to carry more vegan options. Abi-Haus—vegan French toast at brunch, y’all! Lunch and dinner options aren’t quite as exciting, but ask about the seasonal veggie plate and seasonal pasta. If nothing else, you can have an avocado and tomato sandwich on sourdough (hold the cheese). 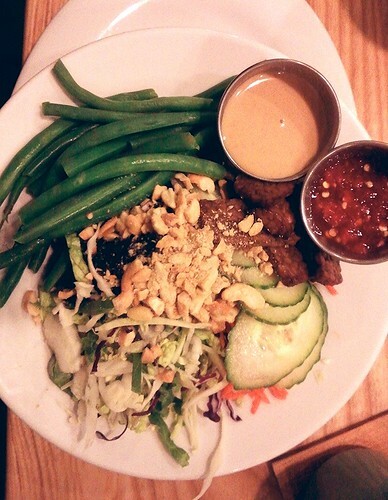 Bangkok Thai—In theory, some menu items can be modified to be vegan. However many diners report communication issues. Ask about fish sauce, shrimp paste, and eggs in tofu dishes. Beware of the veggie egg roll which contains chicken. Bonzai Japanese Steakhouse—The usual edamame and avocado, cucumber, or vegetable sushi rolls. For hibachi, order the vegetarian delight and ask for them to cook with oil instead of butter. Denny’s—Denny’s now carries Amys vegan burgers. A number of the vegetables and sides are vegan. If you’re here for breakfast, you can get oatmeal (no milk) or grits (no butter) with fruit on the side. Fuzzy’s Taco Shop—A Texas chain. 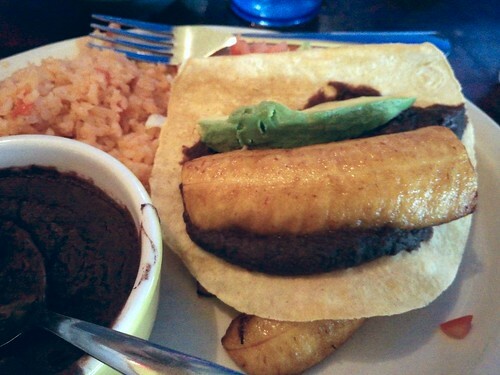 Tortillas, grilled veggies, black beans, refried beans, lime rice, and fried potatoes are vegan. Combine them into a taco, burrito, salad, or fajitas. Allergen/vegan menu is available online (pdf). Genghis Grill—The usual Mongolian Grill experience. Their website charmingly proclaims, All diets welcome! Choose your vegetables (including tofu), sauce, and starch (vegan choices include white rice, brown rice, or udon noodles). Ask for their nutrition menu when you get there if you want to look over the sauces to see which are vegan or check it out online. If seeing your food cooked on the communal grill bothers you, most places like this will cook your food in a separate wok. Jason’s Deli—Chain sandwich shop that has a small vegan menu (pdf) online. Johnny Carino’s—A chain restaurant. Try the angel hair pasta with artichokes (no parmesan) and a house salad without croutons or cheese. Or order a pasta dish with tomato sauce and vegetables (no cheese). I’ve eaten at this chain a number of times, and it’s decent if unexciting. Middle East—Unsurprisingly, this restaurant serves Middle Eastern food. The usual hummus, baba ganouj, tabouley, fatoush, along with a few more unusual options like peayas, described as cubes of potato with mint, onion, lemon, and olive oil. Menu is online at Yelp. Natural Food Center—This health food store includes a small restaurant with daily vegan options including soup, tamales, burritos, chili, smoothies, and more. Grab a vegan dessert from the grocery section on your way out. Natural Grocers—This grocery store carries many vegan-friendly convenience foods and specialty products like dairy-free cheese and yogurt. Red Robin—Another chain with a vegan Boca burger and a robust salad bar. Be sure to ask for the Boca burger as the standard Gardenburger contains cheese. Subway—The veggie delite. We’ve all succumbed to this sandwich at one time or another. Secret vegan trick: buy a bag of potato chips and stuff ’em in your sandwich. And then send a letter to subway asking them to add more vegan options. Tokyo Asia Fusion—Beyond the usual avocado, cucumber, and veggie roll, Tokyo Asia also has a sweet potato roll and an aspargus roll. Or order the hibachi vegetable dinner. Ask for your vegetables to be cooked in oil instead of butter. 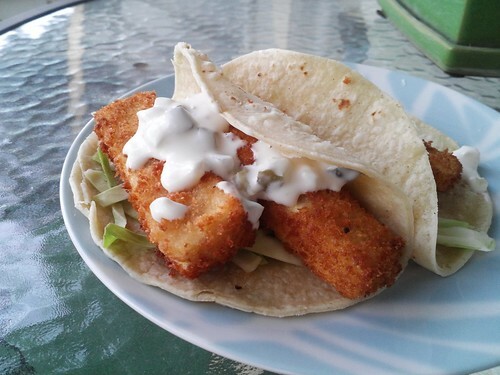 I really wanted to include a fish-style taco in the Taco Cleanse Zine. I’ve made these a number of times. Sometimes I use the Cajun Spiced Tofu from Yellow Rose Recipes as the fish element, sometimes I wing it with my own recipe. Since this is something I make all the time, I figured creating a solid recipe (that wasn’t Joanna’s), would be a cinch. Tofu Fish Sticks from Shmooed Foods (one of the first vegan recipes I ever tried!). This recipe is also in Vegan Lunch Box by Jennifer McCann. To assemble the taco, you’ll need corn tortillas, shredded cabbage (stay far away from the ice berg lettuce! ), and either vegan tartar sauce or cashew lime crema. You can garnish a few pickled jalapenos, a bit of cilantro, or a slice of avocado, but I don’t think they’re really necessary unless you object to monochrome food. You can preorder a copy of the zine from Rabbit Food Grocery or buy one in person at the Taco Cleanse closing ceremony this Sunday, September 29 at the Vegan Nom. There are lots of great recipes that did make the cut, including cumin-spiced rice, achiote-roasted vegetables, and waffle tacos. 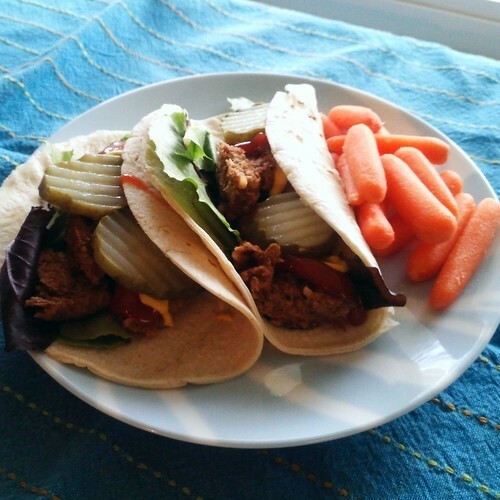 Plus taco games and lots of advice on how to properly taco cleanse. 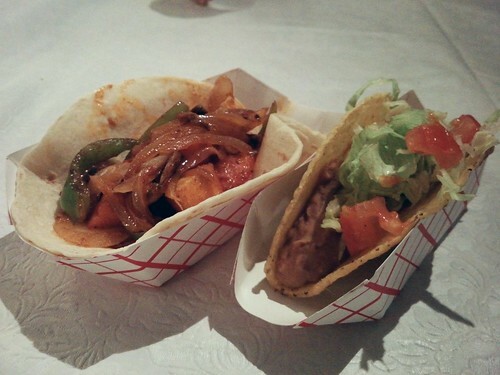 (Left) vegan fajita taco, (right) crispy bean taco from Tamale House East. The crispy bean was the clear winner. Yesterday and today were rough days at work. I’m pretty sure the only reason I made it through was because of tacos. Specifically, Tamale House East tacos. Here’s the thing about Tamale House East (and the original, too). 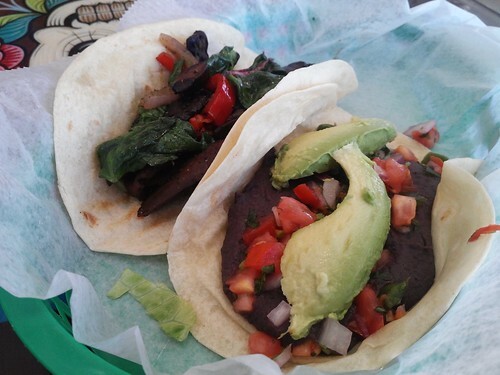 They’re called Tamale House, but they’re known for their tacos. It’s the kind of paradox you have to be able to live with if you’re going for Fuego. But the hard parts of today and yesterday are gone (take that giant project that I finished with three whole hours to spare!). Now I can focus on the fun stuff. Like taco zine construction. Y’all, this zine is going to be awesome. 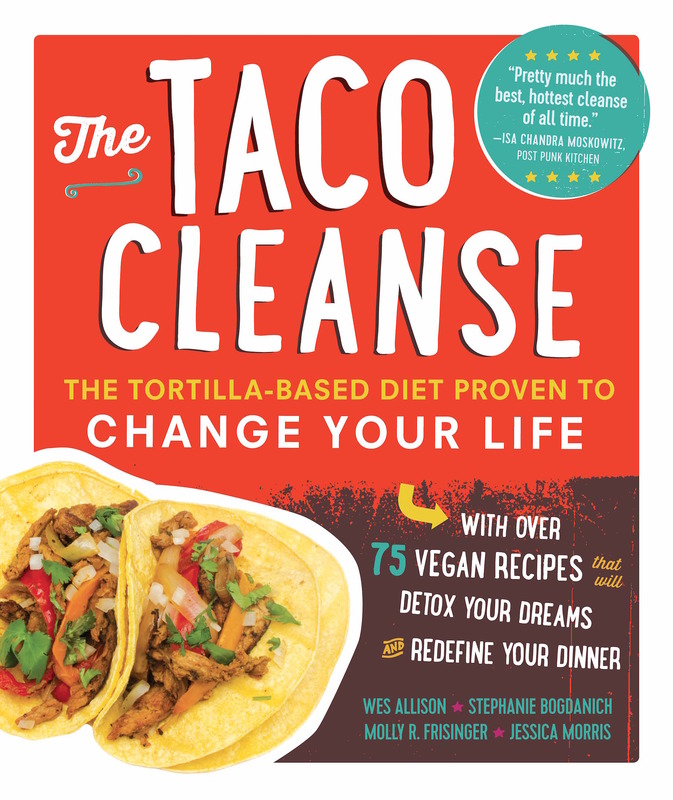 There’s a taco crossword, a foreword by the amazing Laura Beck of Vegansaurus/Jezebel, adorable taco illustrations, taco yoga, a taco personality quiz, taco cleansing tips, and lots of recipes! 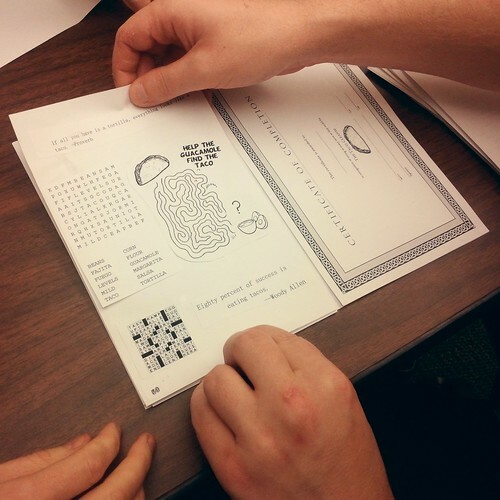 We’re only publishing a small number of the zines. Originally, it was going to cost $2,000, but now you’ll get all this for the low, low cost of $7 (plus shipping and handling). Don’t wait! Preorder your copy of this limited-quantity item now through Rabbit Food Grocery. Which means the taco cleanse is now doctor approved! Also, I get to tell my husband that he’s wrong and I’m right about that C.S. Lewis thing. Best day ever! 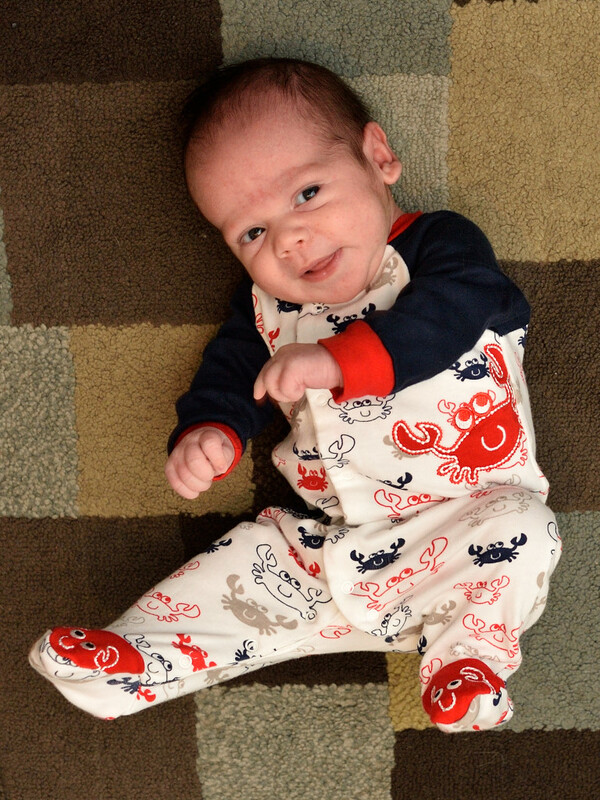 Today we celebrated a new coworker by going out to lunch. Tacos for everyone!